With Twitter becoming more mainstream everyday, it becomes obvious that people will use and adapt it to what they do day in and day out. As some of you know I work with the ALERT group. ALERT is a Ham Radio group that works directly with the National Weather Service in Birmingham to pass spotter reports to forecasters. We are always looking for ways to help gather reports for NWS. Now that you have some background how can you facilitate this? Twitter web page: you can type in search terms in the following box, once entered you get the option to save that search. Find Twitter desktop client you can run on your pc or mac. TweetDeck: also has a way to add a search column to the application. Find a client you can use mobile. 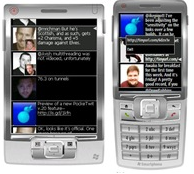 PockeTwit: a windows mobile client that has saved searches as a feature as of today. At the time of this writing Iâ€™m not aware of any other mobile clients that have integrated search. I hope that give you a starting point! I look forward to seeing your weather reports around the Twittersphere!